The Civic Federation recently released its annual Effective Property Tax Rates report, which examines two- and ten-year trends in estimated effective tax rates for residential, commercial and industrial property in selected northeastern Illinois communities. The report highlights that in the ten-year period between tax years 2007 and 2016, effective tax rates increased in all of the selected communities, including in Chicago, suburban Cook County and the collar counties (Lake, McHenry, Kane, DuPage and Will). This blog will specifically look at the ten-year trend for residential property in Cook County. An effective property tax rate is an estimate of the percentage of a property’s full market value owed in property taxes during a given tax year. It offers a method of comparing property tax burdens across municipalities and counties. For example, the report shows that in 2016 the estimated effective property tax rate for property owners in a selected tax code in Evanston in Cook County was 2.22%. More simply stated, in 2016 a residential property owner in that particular tax code in Evanston with property worth $200,000 would have an estimated property tax bill of $4,440 in property taxes without any exemptions. 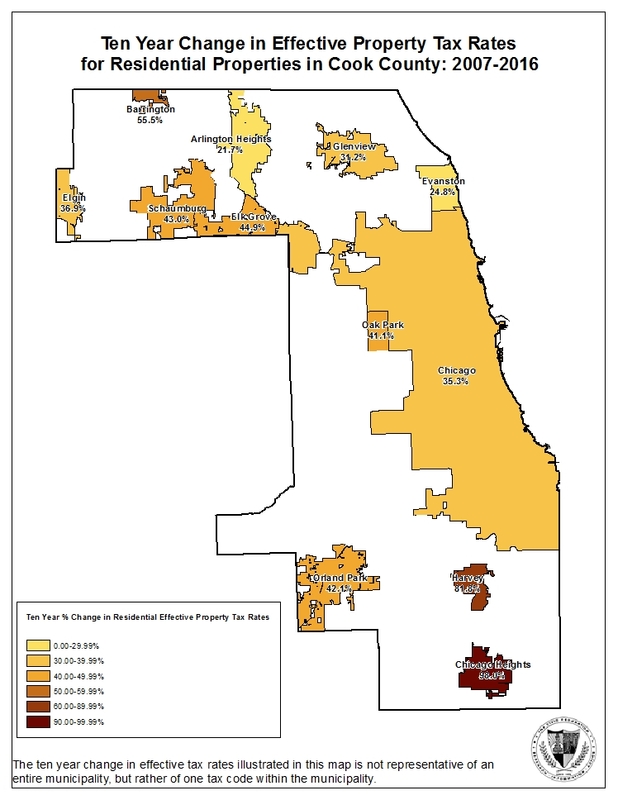 The table and map below show the percent change in effective property tax rates for residential property in the ten-year period between tax years 2007 and 2016 for selected communities in Cook County. 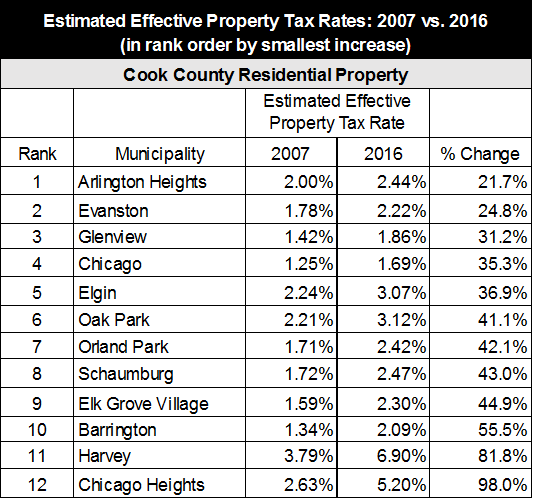 Over this time period, every selected Cook County community experienced an increase in effective property tax rate for residential property, with increases ranging from 21.7% in Arlington Heights to 98.0% in Chicago Heights. Two of the three south suburban communities studied—Harvey and Chicago Heights—experienced the most dramatic increases in their effective tax rate for residential property in this period, with increases of 81.8% and 98.0% respectively, due in large part to a shrinking tax base in both communities. While estimated effective property tax rates cannot be used to accurately determine the precise tax burden on specific properties, they are useful for providing an apples-to-apples comparison of average property tax burdens in different areas over time. To take the most extreme example from the table above, a residential property owner with a home worth $200,000 in a selected tax code in Chicago Heights with a 2.63% effective property tax rate would pay an estimated $5,260 in property taxes in tax year 2007 without exemptions. In tax year 2016, the same home in Chicago Heights worth $200,000 would owe an estimated $10,400 in property taxes if they were not eligible for exemptions. In the ten-year period from tax year 2007 to tax year 2016, the effective property tax rate in Chicago Heights nearly doubled from 2.63% to 5.20%. Change in effective tax rates over time is due to changing actual composite tax rates, changing median levels of assessment, or both. In Cook County, effective tax rates can be affected by changes in the Cook County equalization factor as well. In the case of Chicago Heights, all three factors contributed, but a significant increase in the actual composite tax rate drove most of the increase in the effective tax rate. The actual composite property tax rate in Chicago Heights increased from 11.495% in 2007 to 19.541% in 2016, again due in large part to a falling property tax base. Over the same time period, the median level of assessment as calculated by the Illinois Department of Revenue increased from 8.04% to 9.50% for residential properties. The increasing trend in property tax rates is by no means standard. Between tax years 1999 and 2006—the seven-year period preceding that which is covered in this blog post—every selected Cook County community experienced a decrease in its effective property tax rate for residential property, with changes ranging from -18.9% in Chicago Heights to -2.7% in Harvey. Property tax exemptions available to eligible homeowners reduce the taxable value of their property. The collar counties’ equalization factors do not generally change significantly from year to year because they do not set different property tax assessment levels for different types of property. Cook County is the only county in Illinois that uses differential assessment, also known as classification.